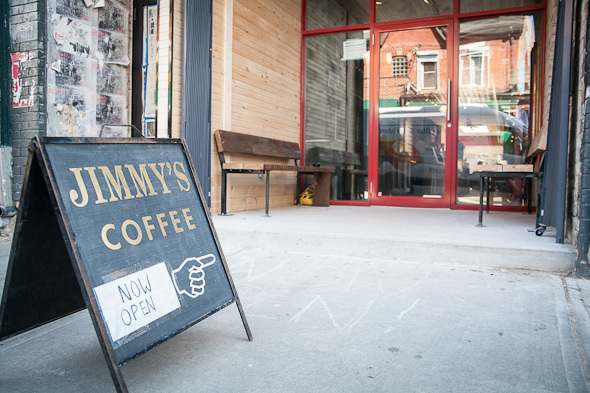 Jimmy's Coffee has emerged from the spent ashes of the Hot Box Café at 191 Baldwin St. in Kensington Market, joining the original and very popular location on Portland. Walking in, you're greeted with a portico type space with outside benches that will either be used by Jimmy's patrons, market regulars, or pot-heads protesting the change in tenant... if their memories serve them well enough (Abbie Roach has since reopened the Hot Box Café just down the street on Augusta.) Reclaimed wood tables, baroque metal tiling, and a working gas fireplace decorate the new space, giving it a bit of a regal atmosphere. After a working trip to Seattle owner Phil Morrison decided to go with an industrial living room vibe. The back area has book cases filled with leather-bound tomes ranging from the Encyclopedia Britannica to Yves Naud's quirky four part "UFOs and Extraterrestrials" series. My double shot 12 oz. 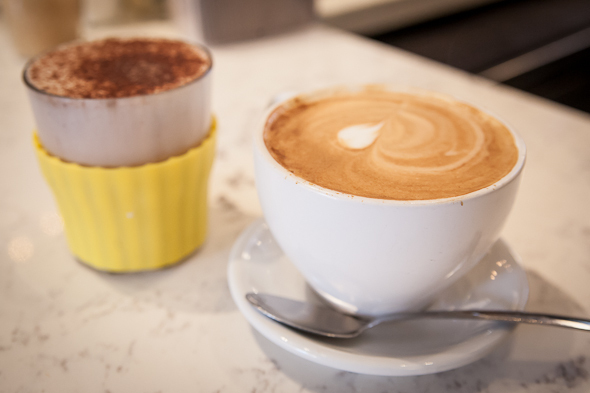 mocha ($4.00, available from 8-12 oz) was measured at an optimal sweetness with subtle salty undertones from the cocoa powder poured overtop, which blended with the steamed milk to create an opulent tapestry of brown flecks. They actually reminded me of local artist Mango Peeler' s murky coloured oil projections. Warm, and creamy steamed ciders were just the right sensory experience for a chilly March day. 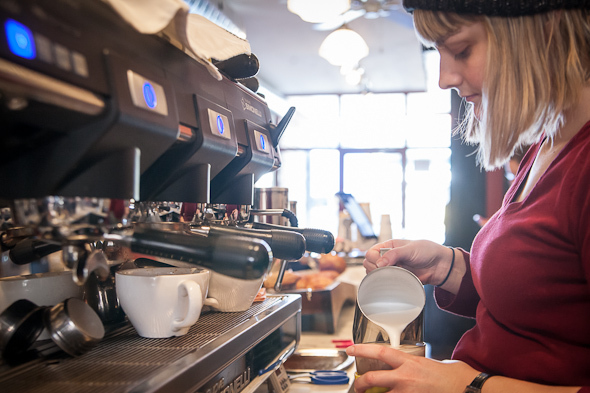 I guess you can steam any drink with the right kind of espresso set-up and barista on hand. 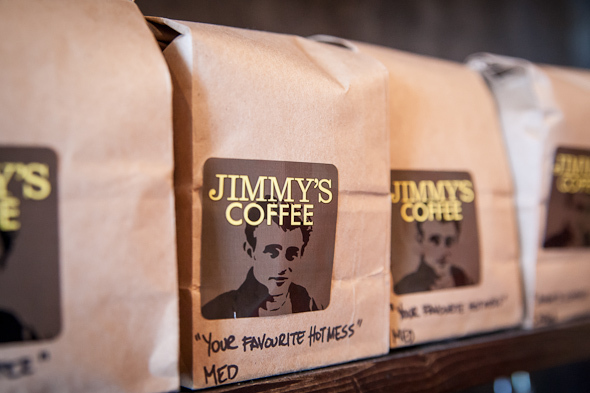 Jimmy's will soon be stocking chemex pour over pots and French press plungers. 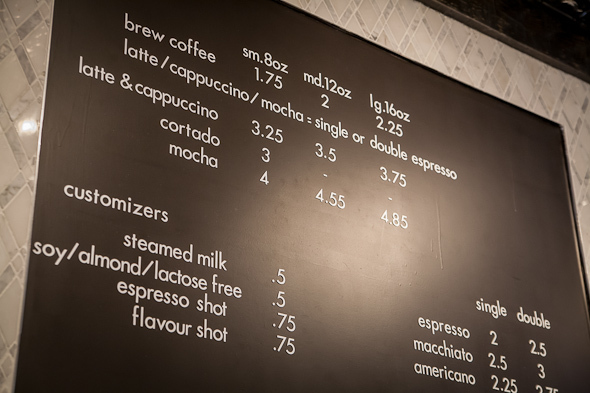 The owners have a strict agenda not to alienate the drip coffee lovers. The dark brew was nutty and earthy with sweet undertones, while the medium was sweet nutty and winey — both equally distinctive ($2.25, minus .25c if you bring your own mug). Treats from OMG Baked Goodness on Dundas W specialize in the innovative and surreal, like the stuffed breakfast hoagie ($3.50), a ciabatta bun filled with cheesy scrambled eggs, and the home made pop tart ($3.50), a strawberry turnover coated with white frosting and rainbow sprinkles, warmed up under the espresso machine hood, an old trade secret. 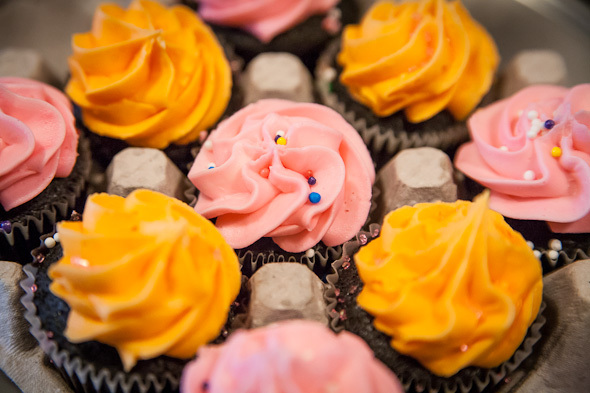 Their moist vegan mini-cupcakes ($1.50) are also on-hand. The infamous Hot Box Cafe back patio has been preserved and a skylight has been added, gloriously flooding the space with vitamin D-rich light on sunny days. The familiar trellises have remained intact but upgraded patio furniture will soon be brought in. If you ever visited the former location's washrooms you'd probably remember how bad they were, but miracles have been worked and they've been restored to full functionality with a modern European home aesthetic. 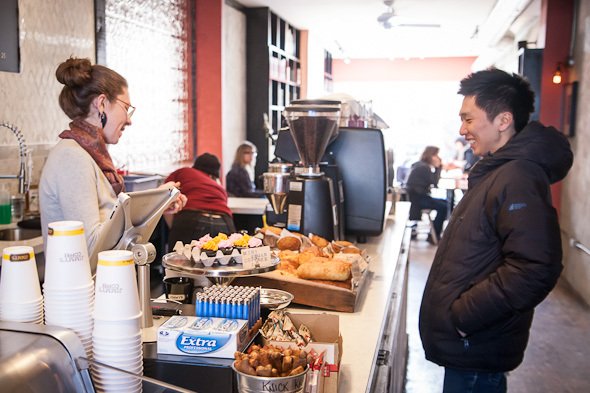 Hanging out at the café at the time of my visit were a pair of young blonde German work-abroad travelers, one who had just landed via New Zealand. 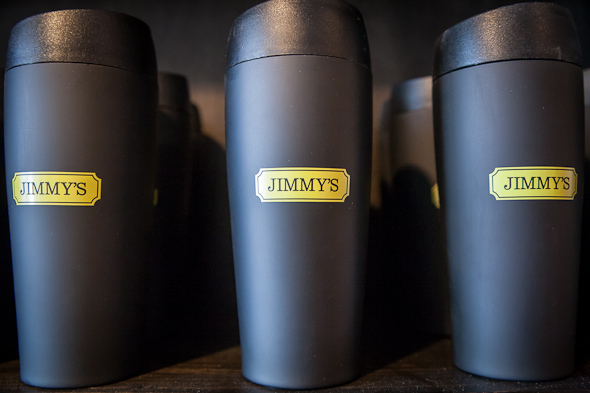 Carina was ecstatic that the Jimmy's team had crafted a flag from her former home on her latte. 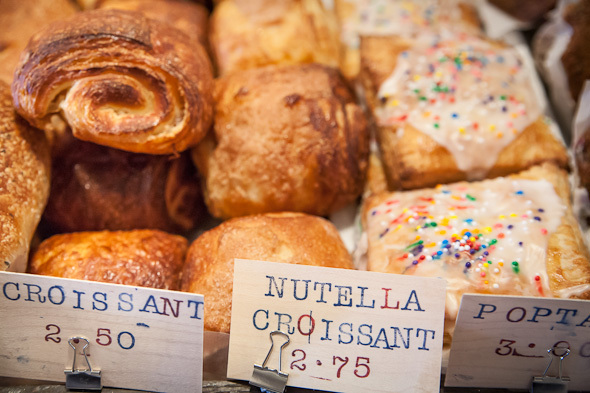 So you can expect the same service and community involvement already on offer at their Portland location. 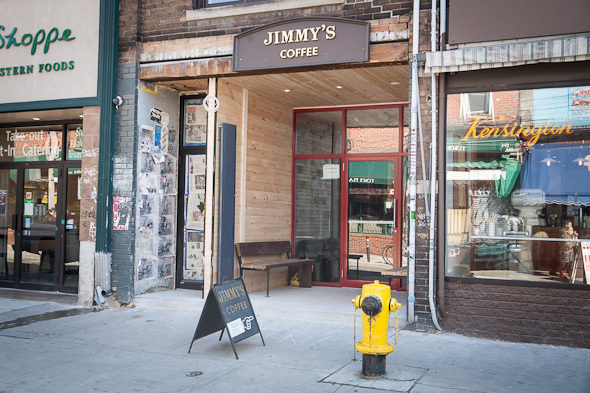 Now with even more space, Jimmy's could very well be an open concept venue for local artists and performers. Stay tuned.